Setting a date for Dennis Oland's new murder trial in the bludgeoning death of his father multimillionaire Richard Oland in Saint John more than six years ago has been adjourned again due to unresolved issues. Setting a date for Dennis Oland's new murder trial in the bludgeoning death of his father multimillionaire Richard Oland in Saint John more than six years ago has been adjourned again because of unresolved issues. Court of Queen's Bench Justice Terrence Morrison of Fredericton, who will preside at the retrial, suggested Tuesday that a pre-trial conference should be held first and set a date of Nov. 2 at 10 a.m.
"It seems to me that there are a number of factors which are going to have an impact on when this trial starts," he said, citing as examples how many voir dires on the admissibility of evidence will be required, whether there will be any pre-trial or Charter motions, and how many Crown witnesses will be called to testify. "It seems to me that until these issues are fleshed out in some detail, it's going to be very difficult to set a trial date that has any hope of being realistic," Morrison said. A pre-trial conference, he said, will give the parties an opportunity to "drill down into the nitty-gritty." The Crown and defence agreed. Oland, who has been free on bail since Oct. 25, 2016, pending his new trial, showed no reaction to the adjournment as he sat in the front row of the courthouse alone. He did not speak to reporters as he rushed out of the courthouse. 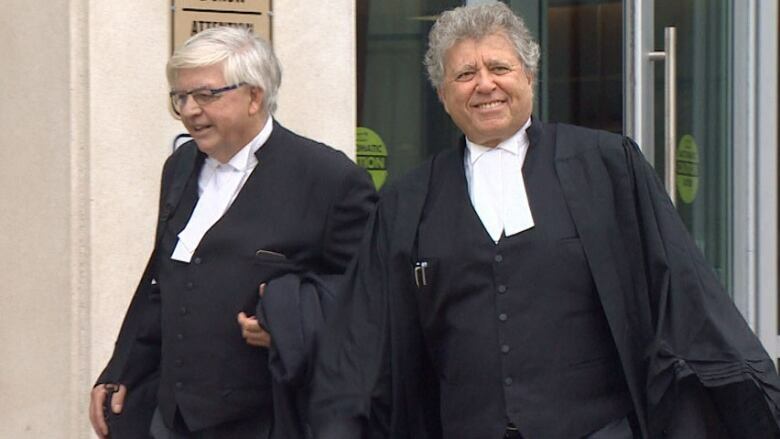 Dennis Oland's defence lawyers, Gary Miller, left, of Fredericton and Alan Gold of Toronto, were both in Saint John court for Tuesday's hearing, along with James McConnell of Saint John. (CBC)Morrison said he had hoped the pre-trial conference could be held sooner, but he understands there is the "possibility of an application that may require additional evidence and some health issues that may prevent that from happening in October." He did not elaborate. Oland's defence lawyers declined to comment following the hearing. "Both are matters about which comment at this time would not be appropriate," lead counsel Alan Gold of Toronto said in an email to CBC News. Asked whether the defence still expects the trial will be held next year, Gold replied, "For sure it will be 2018." Prosecutors could not immediately be reached for comment. Lead Crown prosecutor P.J. Veniot has previously said he is "hopeful" the retrial will be held next year. The judge said he expects detailed written submissions from both parties by Oct. 26. "It would be my hope that at the conclusion of the pre-trial conference we should be able to set some firm trial dates," he said. Oland's retrial is currently slated to last up to 65 days, the same length of time set aside for his first jury trial in 2015 — one of the longest criminal trials in New Brunswick history. The new second-degree murder trial was ordered by the New Brunswick Court of Appeal last fall when it overturned Oland's conviction, but scheduling has been put off at least twice before. A date was expected to be set last month, but both parties requested more time, saying there were "matters that need to be ironed out." Scheduling was previously postponed by about six months while the Office of the Attorney General and the defence both sought to have the overturning of Oland's conviction reviewed by the country's highest court. Prosecutors hoped to have the jury's guilty verdict reinstated, and the defence sought an acquittal instead of a retrial, but the Supreme Court of Canada dismissed both requests last month. No reasons were given. Richard Oland, 69, was found dead in his Saint John office on July 7, 2011. 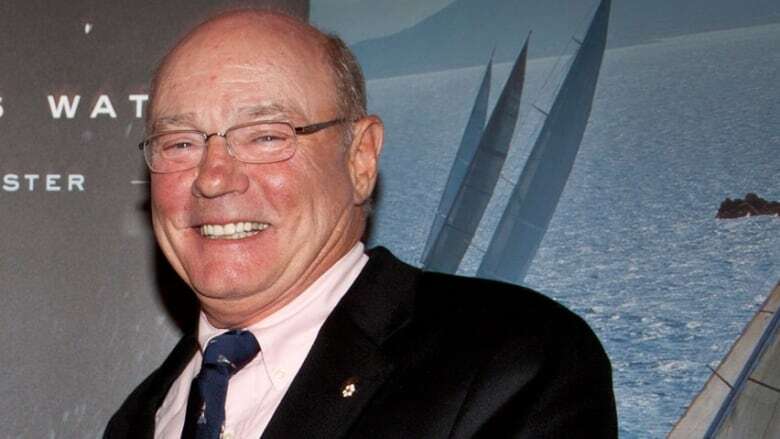 (Canadian Yachting Association)Oland is accused of killing his 69-year-old father, whose body was discovered lying face down in a pool of blood in his Saint John investment firm office on July 7, 2011. The businessman had suffered 45 blows to his head, neck and hands. His son was the last known person to see him alive, during a visit at his office the night before. No weapon was ever found. 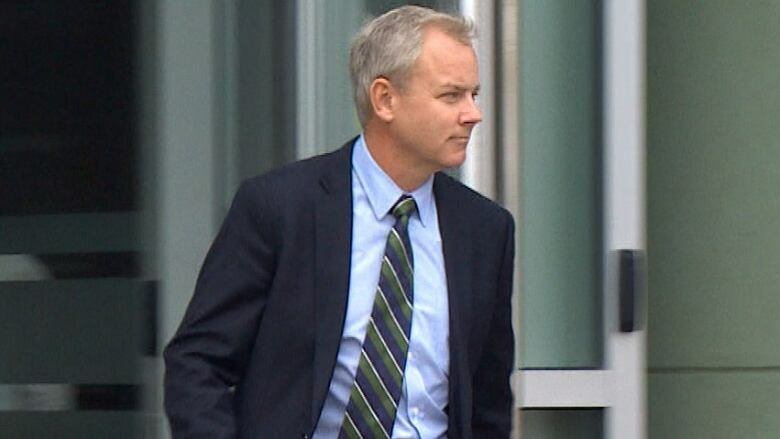 A jury found Dennis Oland guilty on Dec. 19, 2015, following a three-month trial. He was sentenced to life in prison with no chance of parole for at least 10 years. He spent about 10 months in prison before the New Brunswick Court of Appeal quashed his conviction on Oct. 24, 2016, and ordered a new trial, citing a problem with the trial judge's instructions to the jury. Oland was granted bail the following day.